Monsanto - the farmer’s friend? ‘We want to help farmers have more power,’ says Monsanto. But many farmers say this is not true, says Dionne Bunsha. Dhanraj Pawar has always been a farmer - in Maharashtra, central India. Many generations of his family ran the farm before him, and he loved the land. But last year, tired, with too much debt, he sold the land and gave up farming. 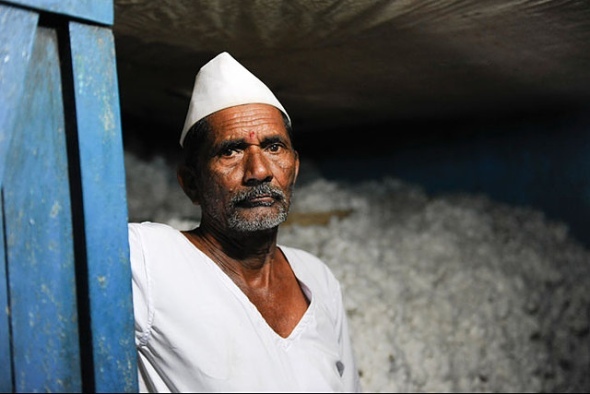 He used Bt cotton seeds, but was very unhappy because he did not get the very big crops of cotton Monsanto promised. These genetically modified (GM) seeds are expensive, but they say say they produce a lot of crops because they protect the cotton from bollworm. Now he plans to move with his family to a nearby city to find work. Dhanraj has no money or home, but he is a survivor. This is the worst agricultural crisis in modern India’s history. More than 296,400 cotton farmers have killed themselves in the past 20 years (information from National Crime Bureau Records). Some drink pesticide, some hang themselves. The farmers kill themselves for many reasons: the failure of agricultural banking, owing too much money to the 'loan sharks', and unfair international trade. Bt cotton seeds are not the only reason for the rise in suicides in India, but they are not the magic solution some people say they are. ‘Many things are against Indian cotton farmers eg. low prices, high costs, agriculture subsidized by governments in the West, and the control of seeds by big companies,’ says Vijay Jawandhia (a farmers’ leader from Maharashtra). He says that Bt cotton seeds should grow on irrigated farms (where they water crops artificially). But more than 80 per cent of Indian agriculture is not irrigated, so the seeds don’t produce as much cotton. ‘This expensive GM technology is only making agriculture more risky and bringing more problems for farmers,’ he says. GM seeds are created by mixing DNA from different species. The new genes come from bacteria, viruses or other things. GM seeds should create plants that are resistant to herbicides, insects and drought, or crops with more nutrition. Some GM seeds, like Bt cotton, contain toxins that kill bugs without using pesticides (that affect the whole farm). But pests are now resistant, so more farmers have to use pesticides and herbicides and this is bad for the environment. But farmers across the world tell a very different story. They do not feel they have more power. They feel Monsanto is bullying and cheating them because it controls the way they use the seeds. Farmers in Guatemala, Mexico and Ghana are getting together to fight against Monsanto and GM. Organic growers in the US, Canada and Australia are fighting against contamination of their fields and destruction of their farms by GM crops from other farms nearby and by the wind. Farmer Dhanraj Pawar has an answer: ‘There is no other seed on the market. Before Bt seeds, we used hybrid seeds. But we can’t find the old seeds in the shops now,’ he says. It helps to have important friends. The Bill and Melinda Gates Foundation, the Clinton Global Initiative, and the US Agency for International Development, all work with Monsanto. They encourage farmers to use Monsanto seeds in the Global South, especially in Africa. But farmers’ organizations do not accept this. In Burkina Faso, the National Union of Agropastoral Workers (Syntapa) is fighting against Bt cotton and biofortified sorghum because they have made farmers very poor and had bad effects on the environment. Bt cotton seeds now costs three times more in Burkina Faso, but they do not produce any more cotton, says Syntapa leader Ousmane Tiendrébéogo. ‘The government wants to encourage GM, so they get money from international organisations and the US – they only give development aid if farmers use GMOs’ says Tiendrébéogo. Many governments have proposed new laws that stop farmers saving and selling their seeds. Some, eg. Ghana and Canada, are trying to change their laws to agree with the 1991 Act of the International Union for the Protection of New Varieties of Plants. This should help protect plant variety and to encourage plant breeders to develop new varieties. But farmers and campaigners say this is making business control of seed patents stronger. And it takes away the rights of farmers to save seeds. This means we might lose more biodiversity. About 75 per cent of plant genetic diversity has gone since the 1900s. Farmers have stopped using their local seed varieties and started using seeds with the same genes that produce more (information from the UN’s Food and Agriculture Organization). In the West, laws that protect companies have been used against several family-run farms. The Canadian farmer couple Percy and Louise Schmeiser are famous in the anti-GM movement. They received a lawsuit notice from Monsanto in 1998 saying they had broken the patent because they had grown Monsanto’s Roundup Ready canola (rapeseed) with no licence. They said that they had never bought Monsanto seed and did not want to grow it. Monsanto seeds came to their farm from their neighbour’s farm or from passing trucks. But Monsanto said Schmeiser knew that he planted this seed in his field and he used Monsanto’s patented technology without permission. Monsanto sued the Schmeisers for $400,000. And the Schmeisers fought the case in the Canadian Supreme Court. The court decided that the Schmeisers had broken Monsanto’s patent law, but they did not have to pay any money because they had not benefited from the seeds. Just in the United States, Monsanto has tried to take 145 farmers to court since 1997. The company says it’s necessary because, if they lose money, they won’t be able to do so much research and development to create new products to help farmers. To stop Monsanto taking small farmers to court, the Organic Seed Growers & Trade Association took Monsanto to court in 2011 to try to stop Monsanto taking organic farmers to court when their farms may have been contaminated by Monsanto’s seeds. The court did not accept the organic growers’ case. They said there was no reason to try to stop Monsanto from suing them because Monsanto had promised that it would not file lawsuits against organic growers if GM seeds accidentally mix in with organics. Monsanto states that two separate courts in 2012-13 agreed that Monsanto took no action against organic growers for crosspollination. Monsanto often seems to have the law on its side, but in Brazil the court has sometimes ruled against it. About five million Brazilian soybean farmers sued Monsanto for charging too much money for crops planted using seed from the harvest the year before. Monsanto said it needed to charge a lot because it reinvests $2.6 million a day in research and development, and this helps farmers and consumers. But in 2012, the court agreed with the Brazilian farmers. The court said Monsanto had to pay farmers about $2 billion because they had charged them too much since 2004 when Monsanto reached an agreement with the farmers to end the legal case. But later, Monsanto asked soy exporters in Brazil to get money for them from seeds the farmers reuse. Brazilian traders did not want to do this, so there is tension between them and Monsanto. When farmers lost their corn crop to a pest attack – even though they used Monsanto’s seeds which are resistant to pests - the Association of Soybean and Corn Producers of Mato Grosso region asked Monsanto and other seed producers to pay them back the money they had spent on additional pesticides. The best victory against Monsanto has been in Maui, Hawaii, in November 2014. People who lived here voted to stop using GM crops – for a time - until Maui county studies the health effects of GM farming and food. Monsanto and Dow Chemical try out GM crops in Maui and also grow GM seed there to sell. This has created several problems: chemical pollution, problems with babies at birth, water contamination and glyphosate (in Monsanto’s ‘Roundup’ seeds) toxicity in residents (information from the website of the Sustainable Hawaiian Agriculture for the Keiki and the ‘Aina (SHAKA) Movement which led the campaign for the ban. Monsanto and Dow Chemicals spray more than 80 chemicals on their GMO fields in Maui. This is not controlled by the US Environment Protection Agency (say the SHAKA Movement). ‘The ban on GM crops protects small farmers from needing more, stronger chemicals to control the weeds and insects that are now resistant in the areas around the GMO fields,’ says the website of the SHAKA Movement. Their food crops were contaminated by GM crops they didn’t want and the companies took the farmers to court for breaking the patent agreement. Monsanto and Dow are fighting against the ban. Across the world, farmers affected by GM seeds have tried to fight against Monsanto. But Monsanto’s control continues to grow and its markets continue to expand. Dionne Bunsha is an award-winning journalist and editor. She works in Mumbai and Vancouver. NOW READ THE ORIGINAL: http://newint.org/features/2015/04/01/farmer-friend-monsanto/ (This article has been simplified so the words, text structure and quotes may have been changed). This page was last edited on 12 April 2015, at 19:51.